Claire is a family law specialist in the area of law relating to children. Whilst she accepts instructions in all child related cases, she has a thriving public law practice and regularly appears in difficult and complex care cases. Claire has particular experience in cases involving serious and complex injury and in matters of sexual abuse and she has relevant experience of cases concerning factitious illness and induced illness. Claire is regularly instructed by a number of local Authorities in the region but also appears for parents, family members and the children concerned. 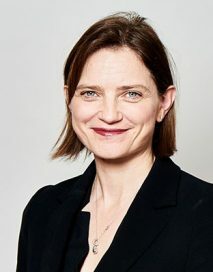 She appears in all tiers of the court system and has considerable experience of representing parties with learning difficulties and mental health issues. Claire not only appears in court in respect of the cases in which she is instructed but is happy to retain a continuing advisory role whilst a case is ongoing, using the benefit of her experience to advise upon evidence and procedure where necessary. She regularly receives positive feedback in respect of her approach to both lay and professional clients, the quality of her written work, her technical ability and her commitment. Appeared in the High Court acting for a child in care proceedings with Court of protection proceedings running in tandem due to the mother’s brain injury. Appeared in the High Court on behalf of the Local Authority in complex sexual abuse matter in which a young child made disclosures against a minor (intervening through the official solicitor) of sexual activity with her, when forensic evidence implicated an adult family member against whom no disclosures had been made. Appeared in the High Court for a child (directly) who was applying for contact to his father in prison. The Local Authority opposed the application and raised an argument as to the competency of the child to act without a Guardian. Appeared in the High Court for the local authority seeking an interim care order and assessments of a child with apparent global delays in his cognitive ability, speech and language and who has little contact with adults outside his immediate family. Appeared in the High Court for the Local Authority as junior counsel in a case concerning the injuries found to an infant upon his death. Highly complex medical evidence involving 10 medical experts from 5 different disciplines. And RE S (A child: no.2)  EWFC 20. Appeared for the local authority before the President of the Family Division on a re-hearing of care and placement applications where the child had been placed with prospective adopters under a placement order, which was then successfully appealed. In 2015 appeared for a family member in a fact-finding case in which the body of baby boy (subsequently acknowledged to have been still-born in the bathroom of the family home) was found in the bathroom cupboard and where the family member was accused of helping and assisting in the birth of the baby and in the concealment of the infant’s body. In 2014 Appeared for the father of two children who was accused of inflicting significant injuries upon the mother of the children. The mother was hospitalised as a result of her injuries and later died in hospital as a result of her complex medical condition.